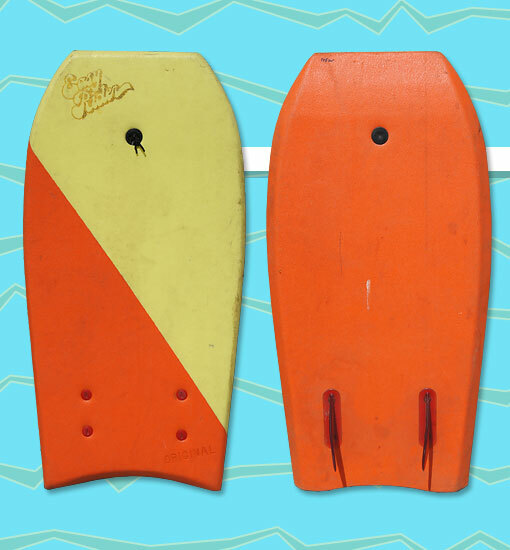 As one of Morey Boogie's early competitors, Easy Rider offered a line of bodyboards that seemed generally inspired by Morey's offerings. The Easy Rider Original was a mid-grade bodyboard with a HDPE bottom skin, much like Morey Boogie's "The Original" model at the time. Unlike Morey Boogie, Easy Rider gave their Original model a crescent tail and two-tone deck, and they stamped the model name near the tail. This particular board features after-market skegs. Photo: Scott Leming.